APEC Steel Frame Systems (APEC SFS), is the process of fast and precise manufacturing of projects, which are designed with a special CAD-CAM software, by CNC controlled roll-form machines with millimetric precision, using corrosion resistant, high strength galvanized, flat, structural steel. Automated branding of all manufactured profiles. Depending on the design, the thickness of C, Z, U and Sigma sections, as well as their flanges, bases and edges (front spoiler) can be adjusted. Depending on your needs, installation and assembly holes of various measurements can be by a precise, CNC controlled technology. In the case of the assembly of C and U profiles via self-tapping screws, screw bulges are prevented by simple application. The special cutting technique ensures the durability of the galvanized coating of profile finishing systems and installation holes, and it provides for corrosion resistance. The length of a construction process is determined by a number of variable factors. The most important factors are logistics and local problems. Buildings which are constructed with the APEC SFS method are minimally impacted by such external factors and they are completed three times faster than all existing methods of construction. APEC SFS structures are lighter than alternative structures and therefore they respond much more flexible to the structural load during earthquakes [seismic load]. They are 20 times lighter as a load bearing systems and nine times lighter when completed. They are resistant to sudden collapses during earthquakes and make sturdier buildings. APEC SFS method can be used in all sorts of building designs. Local features and personal preferences can be easily applied. Considering the construction site costs and management costs, the construction speed is the most important factor in determining the overall expenditure. Given that APEC SFS structures are completed much faster than alternative structures, they decrease the number of workers in the construction site and the costs. Moreover, they also minimize human error in the labour process. Overall, APEC SFS method provides a competitive advantage in the costs and construction time in projects. System sections of walls, floors and ceilings are filled with appropriate isolation materials which vary locally. Buildings constructed with this process have significantly better thermal insulation and soundproofing rates than standard buildings. As opposed to prefabricated structures, APEC SFS structures are permanent structures which could be used for a lifetime. Utilizing a dry construction technique, APEC SFS minimizes the damage to the environment in and around the construction site. Thereby, it also decreases the construction time notwithstanding the cold and hot climate. APEC SFS structures are completed much faster than alternative structures. They are credit viable and therefore enable you to build your dream structure with less financial burdens. The system, which has been developed by APEC, is the outcome of intensive R&D and P&D processes involving design, engineering, manufacturing technology and innovative solutions to details. It is manufactured with the cutting-edge technologies, formed by the cold-rolling process using highly resistant galvanized German Steel. S390-S450-S550 – Highly Resistant Galvanized German Steel Cold-rolled steel, which has the highest strength-to-weight ratio, makes sturdy and light buildings. It is 30% to 40% lighter than the conventional steel but 40% more resistant. Cold-rolled steel is engineered and manufactured faster than conventional steel. It can be assembled 50% faster than conventional steel. 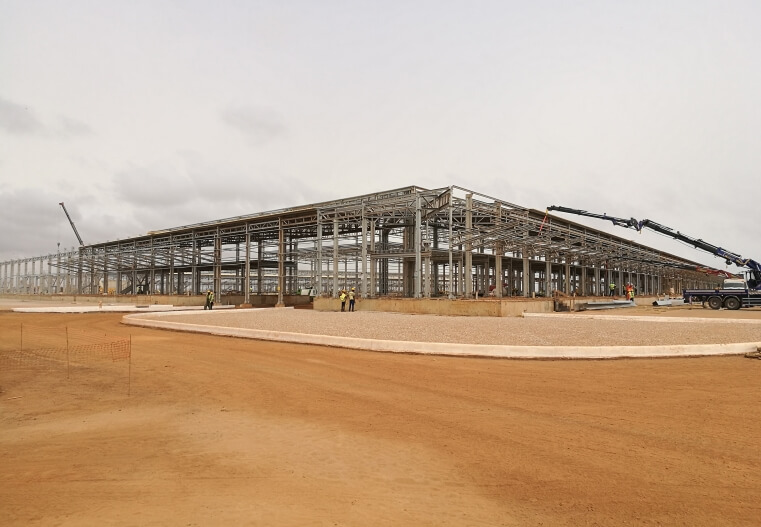 Due to significantly faster assembly, settling the construction site requires considerably less time than that of projects using conventional steel. It reduces the costs for the construction site as it requires less excavation and less depth foundation than conventional steel. All assembly parts can be carried by 2-3 people. Minimizes lifting/removal and labour costs as it provides for the use of lighter mobile cranes. Requires less logistics costs as it is lighter than conventional steel. Provides the support of expert construction supervisors for the assembly all around the World. Due to the use of highly resistant bolted joints, the structures can be disassembled, moved and reassembled in a different location. Due to the use of minimum 275g/m2 galvanized steel, the structures are corrosion resistant. Solutions which do not require maintenance (Does not require welding, sanding or painting). Environmentally friendly buildings (recyclable steel dividends and coating materials). Custom designs to facilitate the special needs of the customers. Mono-layered coating or isolated panelling options (Standard RAL 9002 or alternative colours) Easily applicable standard accessories (4x4m half storey, 1x2m single entry door, ceiling lighting fixture). APEC R&D Department provides advanced and solution-oriented support considering all needs of the customer. Due to the use of CNC machines and advanced engineering software, human errors in the manufacturing are eliminated. Engineering design in compliance with international standards. APEC; constructs industrial and commercial buildings all around the World by using SMART STEEL STRUCTURES which provide original, fast and technological solutions. Factories, plants, workshops, sales offices, shops and other special solutions for similar needs for commercial buildings. 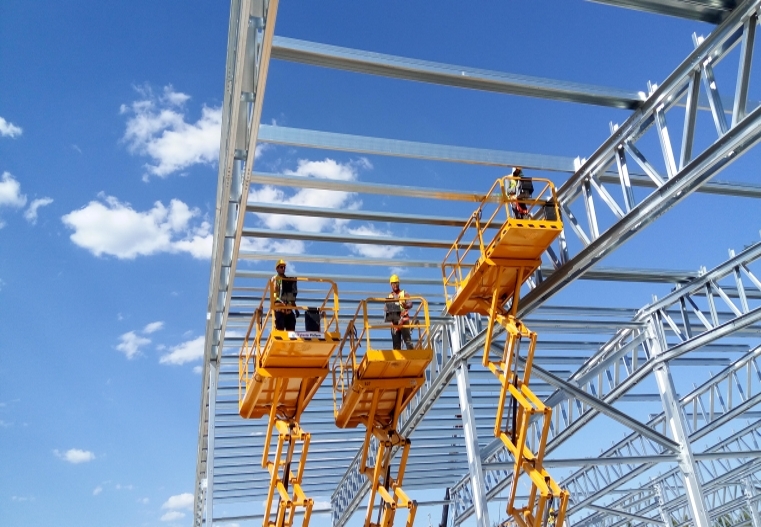 High-ceilinged and wide storage units which could be used for a variety of purposes, warehouses to secure commercial goods and hangars for heavy construction equipment and vehicles. Logistical storage and stock areas necessary for your business, cool stores for fresh fruits and vegetables, meat products and water, wholesale market halls. Football pitches, basketball, handball and tennis courts, and similar structures, turnkey sports facilities designed for the needs of public institutions, municipalities and the private sector. Social facilities such as Dormitories, dining halls and other similar social facilities necessary for your construction sites or business. Inexpensive solutions for animal shelters, greenhouses and growth chambers, equestrian facilities, farm buildings, livestock silos, barns, poultry facilities and other agricultural buildings. Wide and high-ceilinged hangars, hardened aircraft shelters, repair and maintenance buildings for planes, helicopters and other air vehicles necessary for the aviation sector. In addition to the cold-formed industrial steel structure production line, APEC provides hot-rolling design, production and assembly services. 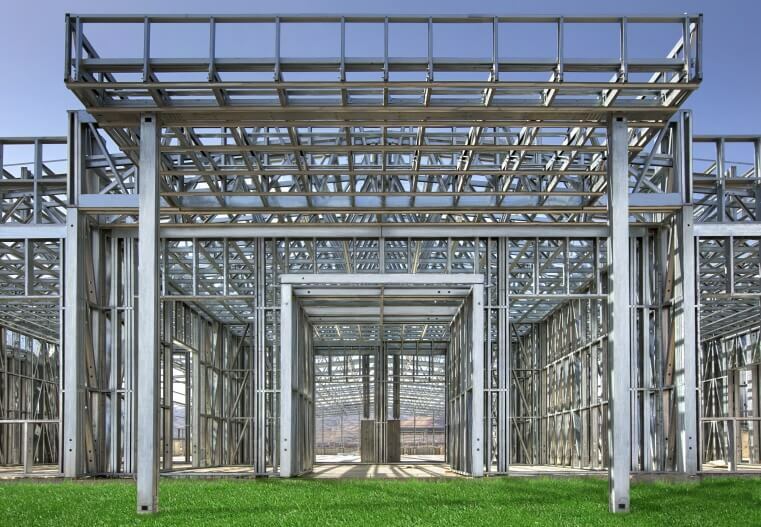 Conventional steel structures can be defined as structures, which are steel profiles manufactured with the hot-rolling process (hot-rolled steel profiles) and they are commonly used in buildings. Hot-rolled steel profiles are manufactured by drawing melted steel from the roller after the annealing process. They are manufactured as I profiles, U profiles, angle-brackets, flat steel, solid steel rods, hollow steel boxes and pipes. Hot-rolled manufactured components are usually well placed to form a frame system as columns or beams. The wall-thickness of load-bearing component profiles vary between 5mm and 40 mm. This system has been referred to as “conventional steel structure system”.